Rips. Tears. Sprains. Strains. If you’re an athlete, you’ve probably experienced your fair share of them. Sports injuries are incredibly common, and they range from the annoying (shin splints, anyone?) to the severe (you didn’t really need that ACL, anyway) to the potentially deadly (contrecoup is not a good thing. Trust us.) The likelihood that you’ll experience injury depends on your age, gender, and sport of choice. While athletes of all ages are susceptible to injury, it may surprise you to learn that children are one of the most-injured populations in the sporting community. 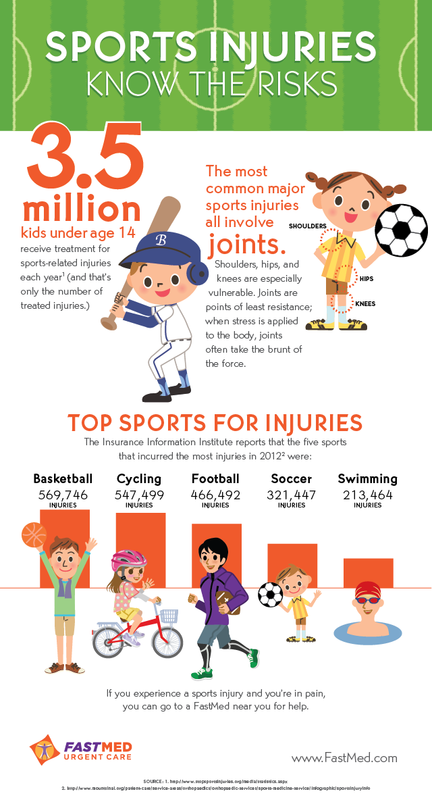 The Insurance Information Institute reports that kids ages five to 14 “accounted for 52 percent of the football injuries … 71 percent of gymnastics injuries … and 41 percent of track and field injuries treated in emergency rooms” in 2012. Stop Sports Injuries, an organization dedicated to helping children play safe, reports that 3.5 million kids under age 14 receive treatment for sports-related injuries each year.1 And that’s only the number of treated injuries; imagine how many go untreated, and you’ll begin to see the size of the problem! The list of sports in which athletes are most susceptible to injury looks like what you might expect, with a few surprises: the Insurance Information Institute reports that in 2012, for instance, basketball and cycling were at the top of the list, beating out even football.2 And though full-contact sports dominate the list, two of the top five — swimming and cycling — are individual undertakings. Clearly, no athletic endeavor is free from risk; over 1,000 people were hurt playing horseshoes, and almost 5,000 injuries were a result of playing billiards! Massachusetts General Hospital reports that strains and sprains — overstretching or tearing of the muscles, tendons or ligaments — are the most common sports injuries. You can usually recognize a sprain or strain by localized swelling and redness. Although sprains or strains are sometimes severe enough to require surgery, they can often be healed with the RICE method: Rest, Ice, Compression and Elevation. According to Mt. Sinai Hospital, the most common major sports injuries all involve joints. Shoulders, hips, and knees are especially vulnerable. Joints are points of least resistance; when stress is applied to the body, joints often take the brunt of the force, and the soft tissues in the joint become strained or torn. These injuries often require long-term rest or surgical intervention. Rotator cuff tears lead the joint injury list, followed by ACL and meniscal tears in the knee, labral tears in the hip, and labral tears in the shoulder. Head injuries shouldn’t be ignored, either; while they are less common, they are often much more serious than joint injuries, and they can lead to brain damage or even death. Concussion is the most common head injury. A particularly bad concussion involves a condition called contrecoup, in which the brain bounces off the side of the skull. Any impact to the head should be treated as a serious injury until a doctor can examine the athlete. Each of these injuries is more common in full-contact sports like football; knee injuries are common in sports that involve footwork, like basketball or soccer, or in cycling from overuse; shoulder injuries are more common in swimming; and head injuries are often seen in soccer and football players. How do I prevent injuries? Know the facts about injuries that are prevalent in your sport so you can take precautions to try to minimize the risks. A few protective measures can go a long way. 1) Lift Weights. One way to protect joints is to strengthen the muscles around them. Hit the weight room as a part of your training routine. 2) Stretch. Not only does stretching before play warm up your muscles, making them more mobile, they will also loosen up so they are less likely to rip. 2) Rest. Don’t overtrain; tired muscles are more susceptible to strain. Take at least one full day off from training per week. 3) Get the right equipment. This step is especially important in contact sports. Wear well-maintained and effective gear like helmets, pads, and shin guards. 4) Don’t ignore pain. Muscling through it is not the way to go; you’ll likely exacerbate your injury. If you’re in pain, rest. If you feel some strain, but not enough to keep you out of practice, then wear a brace on the affected area until the feeling subsides. Your body will let you know if it’s injured — listen to it. 5) Work hard. Don’t skimp in practice. Don’t take the easy way out. If your technique is in top shape, you’re more likely to be nimble and strong, so that you can avoid mistakes that lead to acute injuries and repetitive-use injuries born of bad form. If you experience a sports injury and you’re in pain, you can go to a FastMed near you for help. We can treat you or refer you to a specialist. You’ll get top-notch care without having to wait for hours in the emergency room, or days for an appointment. Injuries are simply part of the world of sports. However, knowing your risk and being proactive can help you continue to enjoy the thrill of the game for a long, long time. 2. National Safety Council. (2014). Injury Facts®, 2014 Edition. Itasca, IL.